Spectacular houses can be found in Spain too. Like this one, near Altea, in Alicante. Brilliant white, this building by the studio Fran Silvestre Arquitectos won the Red Dot Award: Product Design 2013, for architecture and urban design. 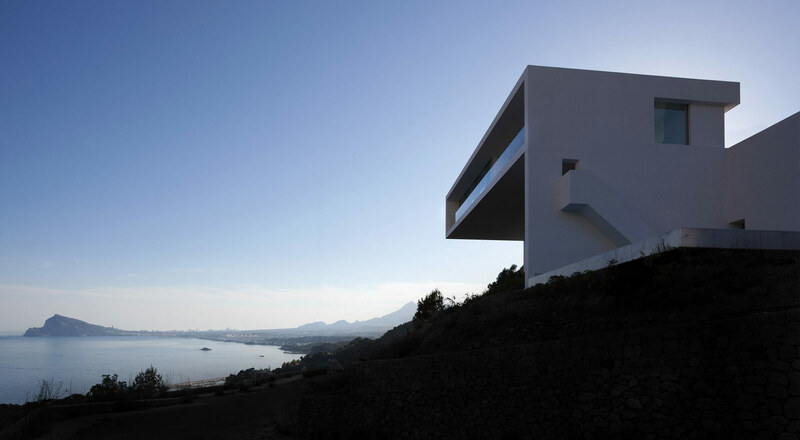 Standing on a cliff, this large house of pure lines appears suspended in mid-air and offers its occupants stunning views. Its white tones are reminiscent of the traditional architecture of the region despite its obviously contemporary style. With one of the Costa Blanca’s gorgeous beaches at its feet, it is divided into various spaces on different levels. Despite its location on terrain with an 80% difference in height, the client wanted a single-storey home. For this reason, and to prevent unnecessary earth moving that could damage the site, part of the house is partially suspended in mid-air and in the entrance level from the road. The garage and pool are on different lower levels. The pool, built on a previously existing flat area, gives an optical impression of being part of the Mediterranean Sea and is covered in white marble. White is also the colour of all the exterior walls, which are made of reinforced concrete covered in a layer of white stucco. The other materials used combine with the pure of the white and the blue of the pool, with the most splendid decor provided by the landscape.